This article is about the championship. For the tournament, see MLS Cup Playoffs. The league hosted its inaugural championship, MLS Cup 1996 on October 20, 1996. Today the MLS Cup is typically held in early December, featuring the winners of the Eastern Conference Championship and Western Conference Championship. LA Galaxy are the most successful team, winning a record fifth Cup in 2014. The MLS Cup's roots trace back to the foundation of Major League Soccer, when the league decided to have a championship format similar to its contemporary North American sports leagues by having the season culminate in a postseason tournament to determine the league champion. For the first few MLS Cup finals, the championship was dominated by D.C. United, who appeared in the first four MLS Cup finals, winning three of them. The inaugural MLS Cup in 1996 was the first championship match, featuring United and Los Angeles Galaxy. The inaugural match had the Galaxy take an early 1–0 lead, and double in early in the second half. However, their lead was relinquished towards the end of the match when Tony Sanneh pulled one back in the 72nd minute. Nine minutes later, Shawn Medved tied the match at two, resulting in overtime between the two sides. Four minutes into overtime, Eddie Pope gave United the golden goal victory. In 1997, the second league cup final was contested at RFK Stadium, where United won back-to-back titles, a feat that would not be accomplished for another decade (when Houston Dynamo won the 2006 and 2007 finals). The game ended 2–1 in United's favor over Colorado Rapids, who would not win a championship until 2010. Jaime Moreno was declared Man of the Match for his goal in the 37th minute of play. This season was also the first time in league history any MLS team won the regular season (Supporters' Shield) and postseason title in the same season. D.C. United's run ended the third year, when they made a third run to the MLS Cup finals, only to lose to the expansion-side Chicago Fire by 2-0. However the following year, United repeated their "double" of winning both the Supporters Shield and MLS Cup the same season. This time, it was a 2–0 win over the Galaxy in the 1999 MLS Cup final. For the first time since 1997, the 2000 MLS Cup final saw a new club reach the finals along with the Fire. This time the Kansas City Wizards won their first MLS Cup with a 1–0 victory over the Fire. From 2001 through 2004, the MLS Cup finals saw a rising of the California Clásico when stateside rivals, L.A. Galaxy and San Jose Earthquakes clashed together in the 2001 final. 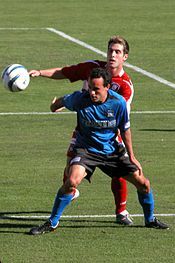 The match also saw the rise of U.S. national Landon Donovan who won a Newcomer of the Year award and tallied the equalizer in the Earthquakes 2–1 championship victory over the Galaxy. With the largest crowd in MLS Cup history at hand, the New England Revolution took on the Galaxy in the 2002 finals. For the match, over 61,000 fans were in attendance at Gillette Stadium to witness the final. In the second period of sudden-death overtime, the Galaxy nabbed their first MLS Cup title, and sparked the start of a string of MLS Cup losses for the Revolution. The 2003 final saw the league leaders for that season go head-to-head. Two clubs that had MLS Cup experience, the Fire and Earthquakes, played for the final that year. The two clubs had successful regular season campaigns with the Fire winning their first Supporters' Shield, and the Earthquakes being the Western Conference regular season and post-season champions as well as having the second best overall regular season record. In a hotly contested match, the Earthquakes won with their second MLS Cup title with a 4–2 score making it the highest scoring MLS Cup final in league history (six goals). After a four-year absence, United made their fifth trip to the MLS Cup final, playing against the Wizards for MLS Cup 2004. The match had four goals scored in the first 25 minutes, with United rallying for a 3–1 lead. Midway through the second half, United had relinquished a penalty kick. Josh Wolff scored for Kansas City, bringing the game within a goal. D.C. United was able to retain the lead, by winning their fourth MLS Cup title, by a score of 3–2. Until 2005, the MLS Cup championship games had been dominated by clubs that had either won or had come close to winning the Supporters Shield. In the 2005 MLS Cup championship, the match was won by the Los Angeles Galaxy, who won the league title by having a 9th-place overall record. Consequently, the Wizards had a better record, but did not qualify for the playoffs because they finished 5th in the Eastern Conference, in spite of an 8th-place overall record. The result prompted MLS to create new wild-cards that were used starting in 2006, where only a certain number of clubs per conference could qualify, and the next best overall teams regardless of conference would also qualify. That in itself prompted debates about the league switching to a single table and a balanced schedule. The single table has yet been instituted, but in 2010 the league instituted a balanced schedule. During the 2012 season, the league resumed an unbalanced schedule. At the start of the 2006 season, MLS created their version of the scudetto (Italian for "small shield"), a symbol worn on the jersey by the team who won the previous season's Serie A (the top Italian league). 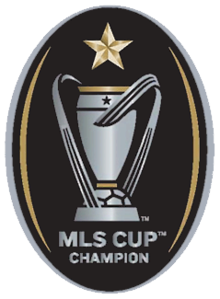 The MLS scudetto was originally a curved, triangular badge featuring a backdrop of the American flag behind a replica of the Alan I. Rothenberg MLS Cup trophy. First worn by Los Angeles Galaxy in 2006, following their 2005 MLS Cup title, the Houston Dynamo wore the same triangular scudettos in 2007 and 2008 during their dual-cup run. 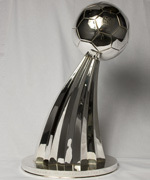 It was redesigned after the 2008 season after the change to the MLS Cup trophy. It is now an oval-shaped black badge with the Philip F. Anschutz Trophy in the middle. The MLS scudetto is worn by the winning team the season following the victory. It is only during the subsequent season (two years after winning the championship), that the team adds a star – a common soccer signifier of titles won – above the team logo. The team can display the star on other items beside their jersey in the year after winning the Cup, but only if the scudetto is not shown. The Columbus Crew was the first team to wear the redesigned scudetto. Real Salt Lake would wear the scudetto in 2010 after winning their first MLS cup in 2009. A year after the Colorado Rapids would also wear the scudetto after their cup run in 2010 for the 2011 season. Finally the Los Angeles Galaxy would wear the scudetto after winning the MLS Cup in 2011, ironically it would be the last team to wear the redesigned scudetto. After the 2012 season, MLS decided not to use the scudetto for upcoming season and instead the defending MLS Cup champions would have a gold star above one or more silver stars indication the team's MLS Cup wins, followed by an additional silver star added to the lined stars the following season. The Los Angeles Galaxy were the first to receive the gold star above the team's three silver stars for the 2013 season. While the Galaxy earned their second MLS Cup trophy and the Houston Dynamo earned consecutive cups, the New England Revolution went on a run of making three consecutive MLS Cup finals, losing all of them. Two of their three losses were in extra time, while the other was lost on penalty kicks. The infamy gave the club the title of being the Buffalo Bills (an NFL American football team) of MLS. This was in reference to the Buffalo Bills Super Bowl games in the early 1990s, in which they lost in four consecutive appearances. In the 2005 final, they lost to the Los Angeles Galaxy, a rematch of 2002, in the final. Held at Pizza Hut Park (now Toyota Stadium) in Frisco, Texas, the Galaxy defeated the Revolution by a score of 1–0 thanks to a 105th-minute overtime goal from Galaxy midfielder and Guatemalan international, Guillermo Ramírez. Ramírez's goal sealed the Galaxy's second MLS Cup title, and left the Revs searching once again. In 2006, the championship was once again played in Frisco at Pizza Hut Park. This time the Revolution took on the Houston Dynamo. Both were coming off a successful season, in which they fell short of winning the Supporters' Shield. A sellout crowd of 22,427 attended the match, which is to date the largest crowd in the stadium's history. Revolution forward Taylor Twellman scored an overtime goal in the 113th minute to give the Revolution the 1–0 lead. However, Dynamo captain and forward Brian Ching immediately tied the score following the Revolution's goal. The match went to penalties, in which the Dynamo won 4–3. This left the Revolution for a second-consecutive year searching for league glory. It was also the first time in league history that a club made the MLS Cup final and lost consecutively. In the 2007 final, the Revolution and Dynamo played each other once again for the 2007 cup. Played in Washington, D.C. at RFK Stadium, a crowd just shy of 40,000 witnessed the championship. The announced crowd of 39,859 made it the largest MLS Cup crowd since 2002. The Revolution had a successful season, earning their first U.S. Open Cup title. The Revolution wanted their first MLS Cup crown, and wanted to win their first "Double" in club history. Houston, finishing just shy once again to D.C. United of winning the MLS Supporters' Shield were determined to finish their second season with some hardware, and to defend their MLS Cup title. The match went in the Revolution's favor early on, as the Revolution's captain, Twellman, netted in the 20th minute to give New England a 1–0 lead. However, midway through the second half, the Dynamo retaliated. Dynamo striker Joseph Ngwenya leveled things at one apiece in the 61st minute, and MLS Cup Man of the Match, Dwayne De Rosario gave the Dynamo a 2–1 lead in the 74th. The goal also proved to be the winning goal, as the Dynamo earned the first back-to-back MLS Cup titles since D.C. United in 1996 and 1997. Early in the 2008 Major League Soccer season, the league announced that the championship would be returning to Home Depot Center. Throughout the regular season, the league was dominated by the Columbus Crew, who finished the season with 57 points, and secured the Supporters' Shield title with three matches remaining before the 2008 MLS Cup Playoffs. Traditionally, the Shield winners only rarely made it to the league championship, in spite of usually being the heavy favorites going into the playoffs. However, for the first time in eight years, a regular season champion made it to the MLS Cup final. The Sigi Schmid-led club made their first run to the championship, along with their opponents the New York Red Bulls. For the Crew, being the Shield winners, their run to the final was a bit expected. The Red Bulls making the final was seen as a large surprise, possibly even a fluke. The Red Bulls did not qualify for the playoffs until the last day of the season, where they were the weakest team, in terms of regular season record, to qualify for the playoffs. The match ended up being dominated by the Crew as Columbus defeated New York with ease, 3–1. The point gap between the two clubs was the largest in history, and the scoreline between the two clubs made it tied for the largest margin of victory in MLS Cup history. New York's run to the finals was further emphasized as a fluke when the club had the worst record in 2009. The following championship saw two intra-conference clubs meet in the final for the second consecutive year, this time in Seattle's Qwest Field (now CenturyLink Field). The Western Conference regular season and postseason champions, Los Angeles Galaxy took on Real Salt Lake, who finished fifth in the West. Although the Sounders FC management had originally planned on capping the seats available in Qwest Field to 35,700, surging demand led to the release of an additional 10,000 seats, expanding the total capacity to roughly 45,700. The announced crowd was 46,011. The crowd size was the first championship crowd since 2002 to draw over 45,000 spectators. Televised on ESPN, it was the first time that the MLS championship match was televised on the cable network; the first thirteen were carried on ABC. In the 41st minute, Galaxy striker Mike Magee scored, only for Salt Lake's Robbie Findley to make the tying goal in the 61st. The stalemate was not broken in regulation nor overtime, requiring penalty kicks to decide the match. Thanks to a strike from Salt Lake's Robbie Russell, Salt Lake won their first major trophy. By winning the championship, they gained entry into the 2010–11 CONCACAF Champions League. There, they made it to the final, only to lose to Monterrey of Mexico. At the 2010 season's end, six teams from the Western Conference qualified for the playoffs, whereas only two clubs from the East qualified, making it the largest disparity between the two conferences in league history. The league's seeding at the time awarded conference winners earned the top seeds, the two weakest Western Conference teams, San Jose Earthquakes and Colorado Rapids were seeded against the Eastern Conference champion, New York Red Bulls and runner-up Columbus Crew, respectively. Some cited this as an unfair advantage for the Rapids and Earthquakes, as both teams made the semi-finals. In the end, the Rapids played FC Dallas for MLS Cup 2010, winning 2–1 in overtime. Between the 2011 and 2014 MLS Cups, the LA Galaxy appeared in three MLS Cup finals, winning every single final, having the most success in MLS Cup in a short period of time since United's late 1990's dynasty. 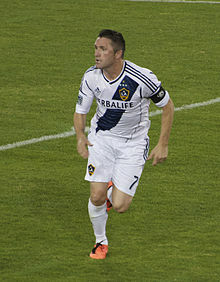 The only final that the Galaxy did not win, came in 2013, where they lost in the 2013 Western Conference finals to eventual runner-up, Real Salt Lake. During that time, the Galaxy became the first MLS franchise to win five MLS Cups, when they won MLS Cup 2014. These teams contained several high-profile players including Landon Donovan, Robbie Keane, Gyasi Zardes, David Beckham and Omar Gonzalez. Some claim that the Galaxy's dynasty began in 2009, when they reached the playoffs for the first time since 2005, and marched to the finals, only to lose on penalties to Real Salt Lake. In 2010, and again, in 2011, the Galaxy won consecutive Supporters' Shield, and completed the league double winning both the Shield and MLS Cup in 2011. This was the first time this had been accomplished since the Columbus Crew achieved it in 2008. In the 2011 MLS Cup final, the Galaxy defeated the Houston Dynamo, 1–0 off a 72nd minute Donovan goal. The goal was scored off a Galaxy counter where Beckham fed a through ball to Donovan who slotted it past Hall. The 2012 final featured both the Galaxy and Dynamo again, making it the first since 2007 that an MLS Cup final was a rematch of the previous final. Again, the Galaxy won the final, this time coming from behind to defeat the Dynamo by a 3–1 scoreline. The match was Beckham's final MLS match. During the 2013 season, the Galaxy's chance to three-peat was thwarted by Real Salt Lake. Salt Lake defeated the Galaxy, 2–1 on aggregate, to advance to the MLS Cup final, where they eventually lost to Sporting Kansas City. The following season, the Galaxy reached the MLS Cup final again, playing the New England Revolution, making it a rematch of MLS Cup 2002 and MLS Cup 2005. In extra-time a Robbie Keane goal propelled the Galaxy to their fifth MLS match, a victory in the 2014 MLS Cup. The Portland Timbers won the 2015 MLS Cup, defeating the Columbus Crew 2–1. Portland's Diego Valeri scored the fastest goal in MLS Cup history at 27 seconds when Crew goalkeeper Steve Clark made a fundamental error after he miscontrolled his defender's back-pass while Valeri had advanced towards the ball to strike at the opportunity. The Seattle Sounders FC faced Toronto FC in the 2016 MLS Cup, which was played at BMO Field in Toronto on the evening of December 10, 2016. The temperature at the start of the match was 21 °F (−6 °C) (10 °F (−12 °C), when adjusted for wind chill), with strong winds coming off Lake Ontario. The field was watered shortly before the match, and resultant field was described as icy by players. The Seattle Sounders FC defeated Toronto FC 5–4 in a penalty shoot-out after a scoreless match of 90 minutes regular time and 30 minutes overtime. The Sounders did not register a single shot on goal, becoming the first MLS club to do so in a match, regular season or otherwise. The Sounders, despite a very poor start and mid-season managerial change, became the second team from the Pacific Northwest to win the cup, after Portland in 2015. In the 2017 MLS Cup, Toronto FC and Seattle faced off in a rematch of the previous edition, also at BMO Field. Toronto FC won the match 2–0, and became the first Canadian team to win the MLS Cup, and the first MLS team to complete a domestic treble, after winning the Canadian Championship and Supporters' Shield earlier in the year. Atlanta United, in their second season as an expansion team, won the 2018 edition of the MLS Cup by defeating the Portland Timbers 2–0. 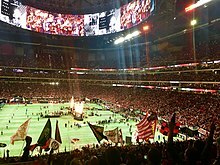 The match, hosted in Atlanta at Mercedes-Benz Stadium, was attended by 73,019 spectators and broke the MLS Cup attendance record set in 2002 by New England. The club became the second-youngest to win an MLS Cup, behind the 1998 Chicago Fire, and brought the first professional sports championship for the city of Atlanta since 1995. The first 13 Cup finals were aired on ABC. ESPN was awarded the rights in 2008. All MLS Cup playoff games are televised on ESPN, Fox Sports, or Univisión networks. UniMás will air two exclusive playoff matches, while ESPN and its affiliated networks will split the rest of the contests – including MLS Cup – with Fox Sports. Univision also airs the MLS Cup in Spanish. The 2016 edition of the final was the first to be aired by Fox. Over the history of the MLS Cup Playoffs, numerous formats have been used. From 1996 to 1999 and 2003 to 2006, the top four teams per conference qualified for the playoffs. In 2000 and 2001, the three division winners plus the next five teams with the next best records made the playoffs. In 2002, the top 8 teams qualified for the playoffs regardless of conference. In 2007, the top two teams per conference plus the next four teams with the next most points qualified. At the 2008 season's end, the top three teams of each conference made the playoffs; in addition the clubs with the next two highest point totals, regardless of conference, were added to the playoffs. In the first round of this knockout tournament, aggregate goals over two matches determined the winners; the Conference Championships were one match each, with the winner of each conference advancing to MLS Cup. In all rounds, the tie-breaking method was two 15-minute periods of overtime, followed by penalty kicks if necessary. The away goals rule was not used. At the 2009 and 2010 season's end, the top two teams of each conference made the playoffs; in addition the clubs with the next 4 highest point totals, regardless of conference, were added to the playoffs. In the first round of this knockout tournament, aggregate (total) goals over two matches determined the winners; the Conference Championships were one match each, with the winner of each conference advancing to MLS Cup. In all rounds, the tie-breaking method was two 15-minute periods of extra time, followed by penalty kicks if necessary. The away goals rule was not used. At 2011 season's end, the top three clubs in each of the league's two conferences earned the six automatic spots in the conference semi-finals. The wild-card entrants, seeded seventh through tenth, entered based upon their overall position in a single table of the league standings. The new format was assembled so that the lowest seed to qualify out of the wild-card rounds will play against the Supporters' Shield winner. The highest wild-card seed remaining will played the conference champion that did not win the Shield. The play-ins proper were single matches, with the higher seeded club playing at their home field. The conference semi-finals were two-leg aggregate series. The conference championships were single matches at the field of the higher seed; the cup final was at a predetermined venue. From the 2012 season through 2014, the playoff structure were further tweaked. While the number of playoff teams remained at 10, the "wild cards" disappeared. Instead, the top five teams in each conference qualified. The No. 4 seed in each conference hosted the No. 5 seed in a single match for a place in the conference semi-finals against the top seed in its conference. The conference semi-finals remained two-legged while the conference finals changed from a single match to a two-leg aggregate series. Finally, the MLS Cup final was held at the home field of the finalist with the highest point total during the regular season. From 2014 to 2018 the away goals rule was used, but did not apply after extra time. From the 2015 season through 2018, the top six teams per conference qualify for the playoffs (12 total teams). The first round of each conference involves the No. 3 seed hosting the No. 6 seed, and the No. 4 hosting No. 5. In the Conference Semifinals the top seed plays the lowest remaining seed, and the No. 2 seed plays the next lowest seed. From the 2019 season, the top seven teams per conference will qualify for the playoffs (14 total teams), and all rounds will be single-elimination throughout. The top team in each conference will have a bye, and will play the winner of the fourth v. fifth place match. The playoff brackets will be fixed, as the league abolished re-seeding. The winner of Major League Soccer's MLS Cup, the final match of the MLS Cup Playoffs, determines that season's league champion. The playoff tournament is organized by the league at the conclusion of the regular season in a format similar to other North American professional sports leagues. The tournament is open to the top 7 clubs of the Eastern and Western Conference. The first MLS Cup final was played on October 20, 1996. As of 2016, the record for the most championships is held by the Los Angeles Galaxy with five cup titles. The record for the most championships lost is held by the New England Revolution, who lost the game five times during their history. The championship has been won by the same team in two or more consecutive years on three occasions. As of the 2018 season, a total of 23 teams have competed in MLS. Sixteen of these teams have appeared in a cup final, with 13 of these teams having won the MLS Cup. For most of the league's history, the MLS Cup champions and runners-up have earned berths into the CONCACAF Champions League, though only U.S. teams are eligible to fill these slots. Canadian teams, even MLS Cup participants, must qualify by winning the separate Canadian Championship; as of 2018[update], the only Canadian winner has been 2017 MLS Cup champion Toronto FC, which also won the Canadian Championship. ^ 1: The 2001 CONCACAF Champions' Cup was canceled, so both MLS Cup 2000 winner, Kansas City Wizards and the MLS Cup 2001 winner, San Jose Earthquakes qualified for the 2002 CONCACAF Champions Cup. ^ 2: The other berth went to the Supporters' Shield winner. ^ 3: The runners-up berth was reallocated to the winner of the conference opposite that of the Supporters' Shield winner. ^ 4: Toronto FC qualified by winning the 2016 and 2017 editions of the Canadian Championship. ^ 5: Seattle Sounders FC qualified as the winners of MLS Cup 2016. ^ 6: Due to the restructuring of the 2019 CONCACAF Champions League, the United States' berths were allocated to the 2017 and 2018 MLS Cup winners and the 2017 and 2018 U.S. Open Cup winners. As Toronto FC won MLS Cup 2017, the vacated berth was reallocated to the New York Red Bulls as the U.S.-based non-champion with the best aggregate record for the 2017 and 2018 MLS regular seasons. Culminating the championship, the winning team is presented with a trophy, known as the Philip F. Anschutz Trophy, named for the contributions and investment to American soccer and MLS by Philip Anschutz. Typically, the award presentation is held on a podium in the center of the field, where the league commissioner will award the team with the cup. Before the actual award presentation, the finalists are awarded with silver medals with the league's logo imprinted on them. The champions are then presented with gold medals, before the trophy is handed to the winning team's captain. In cup history, the MLS Cup champions have been awarded with three different trophies. For the first three MLS Cup finals, the winning team was awarded with the Alan I. Rothenberg Trophy, named for Rothenberg's contributions to American soccer. The Rothenberg Trophy was a dark gold trophy that had two handles around a soccer ball, with the league's logo imprinted on the plaque. 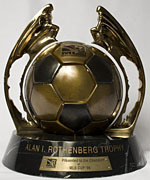 In 1999, the Rothenberg Trophy was redesigned with a soccer ball placed on a beacon. In 2008, the trophy was redesigned again to its present state and renamed the Philip F. Anschutz Trophy. StubHub Center has hosted six MLS Cup finals. In MLS Cup history, seven matches have been played in the Greater Los Angeles area. The next closest is the Washington, D.C. metro area, which has hosted three finals, all of which have been played at RFK Stadium, and Toronto, which hosted the matches three times at BMO Field. Through the 2011 season every MLS Cup had been played at a predetermined site (i.e., announced before the playoff participants were known). On the day before the 2011 Cup, MLS announced that starting in 2012, Cup finals would be hosted by the participant with the highest point total during the regular season. Before the 2012 Cup and the change to awarding the final to the participant with the higher point total, only three teams played the match on their home field. In the 1997 MLS Cup final, D.C. United won the match in their home stadium over Colorado Rapids, RFK Stadium. The same occurrence applied in the 2002 MLS Cup final, where the Los Angeles Galaxy defeated the New England Revolution 1–0, in the Revolution's home stadium Gillette Stadium. As a result, the 1997 and 2002 MLS Cup finals drew the largest crowds in MLS Cup history prior to the 2012 change to the higher seed hosting. In 2011, the LA Galaxy won their 2011 MLS Cup match in their home stadium (Home Depot Center), 1–0, over the Houston Dynamo. The Galaxy became the second team (and first since D.C. United in 1997) to win the Cup at home. After MLS adopted its current criteria for awarding the MLS Cup match, the first three Cup finals were won by the hosts. The 2012 MLS Cup saw a rematch of the 2011 Cup at the same site, with the Galaxy successfully defending the title with a 3–1 win. In 2013, Sporting Kansas City became the third team to win the cup in their home stadium (Children's Mercy Park) when they beat Real Salt Lake in the penalty kicks, which was the longest shootout in MLS Cup history. Then, in 2014, the Galaxy defeated the New England Revolution 2–1 at the renamed StubHub Center in a match that was also notable as the final competitive match for U.S. national team all-time leading goal scorer Landon Donovan. The pattern was broken in 2015, however, when the Portland Timbers defeated the Columbus Crew in the Crew's home stadium. Through the 2011 season, MLS typically announced the championship location either prior to the start of its respective season, or even a few weeks into the campaign. For the 2011 championship, the league selected Home Depot Center in Carson, California, making it a fourth time the league's championship had been hosted at the venue. To date, the coldest MLS Cup final was the 2013 championship game played in Kansas City, Kansas at Sporting Kansas City's Children's Mercy Park where the temperature was 20 °F (−7 °C). The hottest MLS Cup final was the 2005 championship game played in Frisco, Texas at FC Dallas's Pizza Hut Park where the temperature was 75 °F (23 °C). The 2010 edition of the MLS Cup was the first final in league history to be played outside of the United States. The match was played in Canada at Toronto's BMO Field, the home ground of MLS club Toronto FC. Pizza Hut Park, now Toyota Stadium, hosted the 2005 and 2006 MLS Cups. Italics indicate a stadium that is now inactive. Following each championship, a player on the winning club is awarded with the title of being the Most Valuable Player (MVP). Usually, but not necessarily, the winner of the award is the player who scores the game-winning goal, or sets up the game-winning goal. This is the case of the 2017, 2010, 2008 and 2007 recipients, who all scored game-winning goals, or assisted several goals for the winning side. Exceptions to this occurred in 2000, 2009, and 2016, where the Most Valuable Player award went to goalkeepers Tony Meola, Nick Rimando, and Stefan Frei, respectively. Meola and Frei, with the Kansas City Wizards and Seattle Sounders FC, both earned shutouts for their respective teams in the cup, while Rimando made two saves in a penalty kick shootout to give Real Salt Lake the title over the Los Angeles Galaxy. At least 39 players have won 2 MLS Cups, mostly for teams with sequential or near-sequential titles (D.C. '96–'99, San Jose '01 and '03, L.A. '02 and '05, and '11–'12, and Houston '06–'07). Players who have won 2 cups with 2 different teams include Joseph Ngwenya, Brandon Prideaux, Frankie Hejduk, Brian Carroll, Ned Grabavoy, Nick Rimando, Will Johnson, Nat Borchers, Brad Evans, Chad Marshall, Drew Moor, Darlington Nagbe, and Jeff Larentowicz. U.S. Open Cup, the oldest ongoing soccer tournament in the United States, dating back to 1914. A. ^ Until 2003, MLS Cup utilized "sudden death" or "golden goal" overtime, i.e. the match ended if a goal were scored at any point in overtime. Beginning in 2004, a 30:00 overtime is played in full; if the match is still tied, it is decided by a Penalty Kick shootout. Dure, Beau (May 31, 2010). Long-Range Goals: The Success Story of Major League Soccer. Potomac Books. ISBN 978-1-59797-509-4. ^ Staff, SI com. "CONCACAF resolves qualifying problem for future CCL". SI.com. Retrieved December 10, 2018. ^ a b MLS Soccer Staff (October 21, 2018). "2019 CONCACAF Champions League qualifying process clarified". Retrieved December 10, 2018. ^ Mainka, Jurgen (October 28, 2008). "Breakfast at Tiffany's: New MLS Cup Trophy Unveiled". Red Bulls Reader. Red Bull New York. Retrieved March 28, 2011. ^ a b Romero, José Miguel (November 17, 2009). "MLS Cup History | Galaxy blanks Revs 1–0 to win 2005 title". The Seattle Times. Archived from the original on November 25, 2009. Retrieved May 4, 2011. ^ Straus, Brian. "2010 MLS Schedule Released, Balance Reigns Supreme". AOL. Archived from the original on October 6, 2012. Retrieved May 4, 2011. ^ Londono, Taurus (March 16, 2011). "For New England Revs fan flashbacks of Buffalo Bills, chance for redemption". Yahoo! news. Retrieved May 12, 2011. ^ "Diego Valeri scores fastest goal in MLS Cup history as Portland Timbers take early lead". Major League Soccer. December 6, 2015. Retrieved November 15, 2016. ^ "Toronto beats Seattle to win MLS Cup". BBC Sports. December 9, 2017. Retrieved December 9, 2017. ^ Roberson, Doug (December 8, 2018). "Atlanta United sets MLS Cup attendance record". Atlanta Journal-Constitution. Retrieved December 13, 2018. ^ Goff, Steven (December 8, 2018). "Atlanta United captures MLS Cup, beats Portland Timbers, 2-0". The Washington Post. Retrieved December 15, 2018. ^ Denman, Taylor (December 10, 2018). "Atlanta United wins over the city and takes the MLS Cup in 2018". Gwinnett Daily Post. Retrieved December 15, 2018. ^ Tannenwald, Johnathan (December 13, 2015). "MLS, U.S. Soccer officially announce new TV deal with ESPN, Fox, Univision". Philly.com. Retrieved November 30, 2016. ^ "MLS Cup set for Primetime on FOX, UniMás, TSN and RDS, December 10" (Press release). Major League Soccer. September 6, 2016. Retrieved November 30, 2016. ^ a b c d e f g "MLS reveals expanded playoffs structure for 2011". MLSsoccer.com. February 23, 2011. Retrieved October 25, 2011. ^ a b Freedman, Jonah (November 20, 2011). "Big changes for MLS Cup Playoffs format in 2012". MLSSoccer.com. Retrieved November 28, 2011. ^ "MLS announces new playoff format for 2019 season". December 17, 2018. ^ "MLS overhauls playoff format, alters league schedule". ^ a0d8cde95eccf7363&form_id=mls_stats_individual_form "1997 Season Statistics" Check |url= value (help). MLS. MLSSoccer.com. Retrieved May 7, 2011. ^ "Team Statistics – 2002 season". MLS. MLSSoccer.com. Retrieved May 7, 2011. ^ "Sporting Kansas City vs. Real Salt Lake". MLSsoccer.com. Major League Soccer. December 7, 2013. Archived from the original on December 9, 2013. Retrieved December 7, 2013. ^ "LA Galaxy 2, New England Revolution 1: MLS Cup Final Match Recap". Major League Soccer. December 7, 2014. Retrieved October 26, 2015. ^ "Home Depot Center selected as MLS Cup 2011 host". MLSSoccer.com. May 9, 2011. Retrieved May 11, 2011. ^ Kaplan, Jonathan (December 8, 2013). "Recap: MLS Cup champions Sporting KC prevail in 10-round penalty shootout after 1-1 draw". Sportingkc.com. Sporting Kansas City. Retrieved December 8, 2013. ^ "Revolution fall 1-0 in overtime to Los Angeles Galaxy in MLS Cup". The New England Revolution Archive. The New England Revolution. November 13, 2005. Retrieved July 19, 2012. ^ Litterer, Dave (April 10, 2010). "The Year in American Soccer, 2005". The American Soccer Archives. The American Soccer Archives. Retrieved May 7, 2011. ^ Litterer, Dave (June 19, 2008). "The Year in American Soccer, 2004: Major League Soccer (Division 1)". The American Soccer. Sover.net. Retrieved October 9, 2011.